Thwarting the Twins is part of the new "challenge mode" solo scenarios introduced by completing the Mage Tower in the Broken Shores. It is by a good margin the most difficult solo content currently available in the game, with the exception perhaps of soloing current raid content. For most Marks Hunters, this encounter seems to be designed for players with an ilvl of at least 910, and a good selection of legendaries to choose from. It is doable from 900 - 910 with a good bit of luck and a lot of planning. It is incredibly difficult below 900. If you don't already have a lot of your best legendaries, I highly recommend spending your Nethershards on chances to get legendaries in specific slots, rather than on getting more pulls on the Twins. While I've heard they're helpful in other challenges, there is almost no benefit to healing legendaries against the Twins. Most any ability that can hurt you will one-shot you. The small amount of damage that Raest does to you by casting Shadow Bolts can be healed easily with Exhilaration, and there are plenty of adds around to kill to reset the CD on it. I do not have Prydaz, so could not test if the bubble it gives you is enough to survive the abilities that would have otherwise one-shot you. Ullr's Feather Snowshoes are a huge benefit. The scenario is a very, very high DPS check, and having the Snowshoes (along with the 2-pc set bonus) will allow you to use Trueshot in every phase. Karam. The extra time you have while they're disoriented gives you a nice chance to damage the Hand, or to gain some distance while kiting. I also tried a few pulls with Sephuz. The added speed bonus is nice, and you will be interrupting and CC'ing quite a bit. In the end, I just felt more comfortable with the knockback and disorient from the wrists, as it seemed to me to be more useful to be able to stand still for a few seconds to cast Aimed Shot or Windburst, rather than to be able to run faster and only be able to cast instants. Lone Wolf - simply for the damage output. Lock and Load - the RNG factor isn't ideal, but two free instant Aimed Shots while moving is great. Posthaste - having a strong kiting utility is helpful, and the reliable speed boost is much more useful than the farstrider RNG movement buff. Explosive Shot - There isn't enough time for standing still Aimed Shots to benefit from Patient Sniper, and Explosive Shot gives good AoE, and an easy to cast instant ability. It's much easier to use than you might expect, when you're constantly strafing in a circle, it only take one jump and a little repositioning to aim it at where your target is going to be. Binding Shot is great for an AoE stun. Wyvern Sting could also be useful if you're having trouble kiting Karam while killing the large Hands, though I found that Freezing Trap, Binding Shot and Bursting Shot were enough. A Murder of Crows - this was a hard choice, I liked both aMoC and Barrage. Barrage helps clean up the adds, but aMoC gave me the extra bit of burst on the twins. I think both are good choices depending on how you attack the encounter. Ultimately, I found the extra adds were mostly just nerve-wracking, not actually dangerous, and Crows gave more more priority target damage, so that's what I went with. If the adds being up makes kiting too difficult for you, go for Barrage. Piercing Shot - since you can't hard cast many Aimed Shots, Trick Shot loses a lot of value, and since you're moving a lot, you nearly always have full focus, so it's easy to get max damage out of PS. I liked to saving Piercing Shot for the Hand, and try to shoo it through Karem and some adds, when possible. Food and Flasks are a must. Treat this fight like showing up to raid. You'll also need two potions per pull. Drums for the bloodlust buff is also a huge help, especially at lower ilvls. In the first phase, you just kite Karem in a circle. If he touches you, you die. There is a small dps check in this phase in that he has a stacking speed buff, making it harder to kite him the longer you go. The phase ends when he gets a little bit below 35%. If you can't do that in less than 80 seconds, the rest of the fight will be incredibly difficult. As long as you keep up Concussive Shot, there's no reason you won't be able to out-kite him. At the beginning, before his speed ramps up, try to hard cast at least two Aimed Shots every Vulnerable. As he gets faster, you may need to only cast one, or even only cast instants. Dropping a Freezing Trap or a Binding Shot gives you extra time to create distance before stopping to make hard casts. There are also some purple puddles that appear on the ground under Karem occasionally. These will slow you if you step in them. You can sort of give yourself more room by going outside the obvious circle (there are little platforms) and let the purple puddles spawn there. But it's not a huge help, so don't bother if it messes up your kiting rhythm. In this next phase, Karem is in "purgatory" and can't be damaged, but Raest now can be damaged, so make a hard swap to Raest and unload on him. You should have your second Trueshot up for this phase. There will also be lots of little adds spawning in this phase. They are slow moving, and need to be kited. Do not focus any of your damage on them. You can and should use multi-shot and marked shot on them when they're in range of Raest, and that along with Piercing Shot or Barrage (if you took it) should be enough to kill enough of them to reset your Exhil and keep your HP topped off. If you can plan your kiting to keep the adds mostly stacked together, all the better for killing them off while focusing on Raest. I recommend using your second potion and drums during this phase. 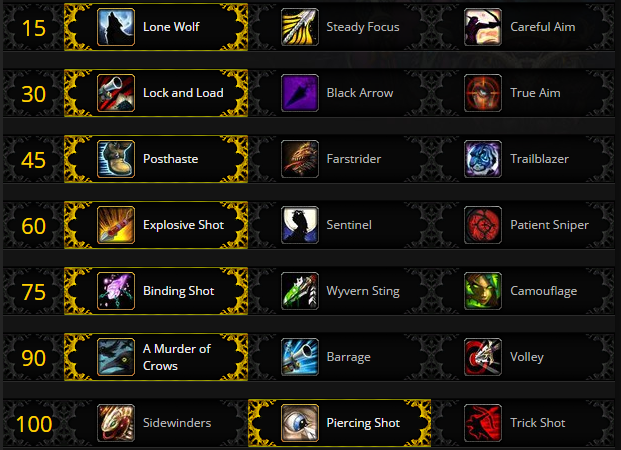 You should have the most up-time on Raest, and the easiest time kiting the adds here. Phase 4 is also an acceptable time to use them, but I found I gained more damage to Raest from using them here. When Raest again becomes immune, Karem will start chasing you again. Kite Karem and the adds while prioritizing damage against Karem. A large hand will appear every 30 seconds; this fortunately lines up well with your interrupt, because if the large hand gets a cast off, you will insta-die. Whenever the Hand appears, swap to it as soon as possible and start damaging it. Interrupt its first cast, and then kill it as quickly as possible. Using Freezing Trap on Karem at this point is very helpful so you can stand still and cast Aimed Shots and Windburst. If you cannot kill the big hand in less than maybe 10 or at most 15 seconds, then you likely do not have enough gear to do this challenge. You need to keep the hands dead, so you can spend the time in between hands killing Karem and progress to the next phase. This phase is also a good time to find out how well your UI is optimized. You need to know where all the adds are, know where Karem is and how long you have CC on him, including Concussive Shot and Freezing Trap / Binding Shot's stun / Bursting Shot's disorient, and you need to be able to swap to the hand to get the interrupt off, and swap back and forth between the hand and Karem to CC or keep concussive up. Phase 4 is much like phase 2, but the added mechanic is there will be a rune dropped on the ground. You need to stand in this rune until it goes away, otherwise some huge rune monster (I didn't catch what it was called) will appear and kill you. I could not figure out any way to successfully kite these creatures, so standing in the rune is the top priority. It is virtually impossible to continue if you cannot kill of Raest during this phase. As all of the mechanics will compound on each other. If you can kill Raest, then you've essentially won the fight. If you do not kill Raest before Karem finishes Purgatory, Karem will begin chasing you again. You'll have to kite him, and the adds, and soak the runes, and interrupt and kill the Hand while trying to kill Raest. When Raest dies, all the adds de-spawn, so now we're back to only having Karem and the Hands to deal with. Simply kite him around the circle, keeping Concussive Shot up 100%. Kill the big Hand as soon as you can when it spawns, or at least keep it interrupted if you're about to be able kill Karem. I've heard a rumor (which I haven't confirmed myself) that you don't actually have to kill Karem to official win the encounter, and that if you die to Karem in the final phase, you'll still be able to turn in the quest; however, I expect all of you who read this blog to go ahead and kill Karem anyway. Hunters pay their dues and do not take the easy way out. I personally watched this video from Signs of Kelani before I killed the twins. Somewhat embarassingly, it took me quite a few pulls to realize the connection between the Rune and the big add, until I saw him soaking it in the video. Azortharion also has a video available here. There are tips in the video description, too. If you set Karem to be your focus at the beginning of the fight, you won't have to swap targets to cast concussive shot on him, with this macro. Along those lines, you can do the same thing with your interrupt for the Hand from Beyond. If you want to use both, you can actually put the name of your targets into the macro to avoid having to use a Focus, just add "/targetlasttarget" in a new line at the end of the macro.